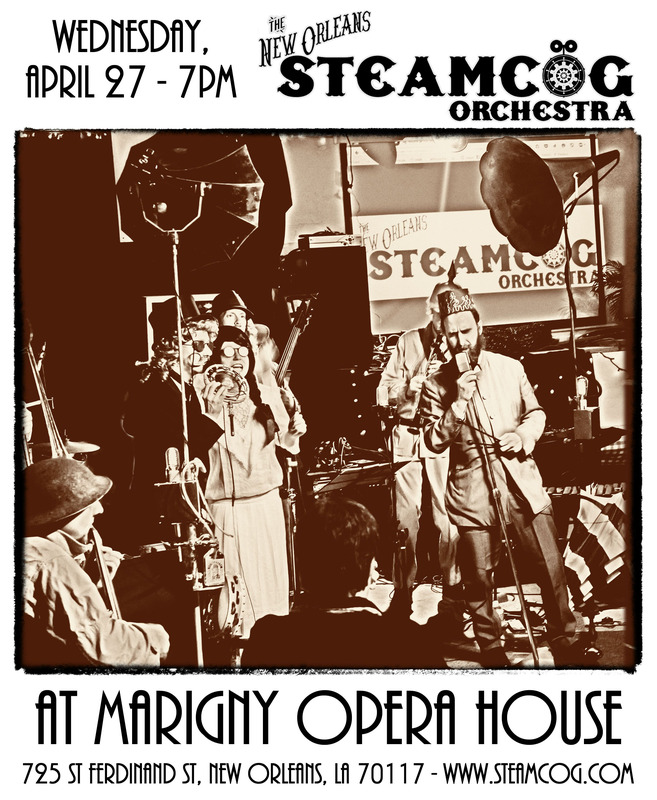 Another lovely night in the echoey but beautiful old church building that is now the Marigny Opera House - small crowd, but well entertained, and people came all the way from Alabama to see us perform! 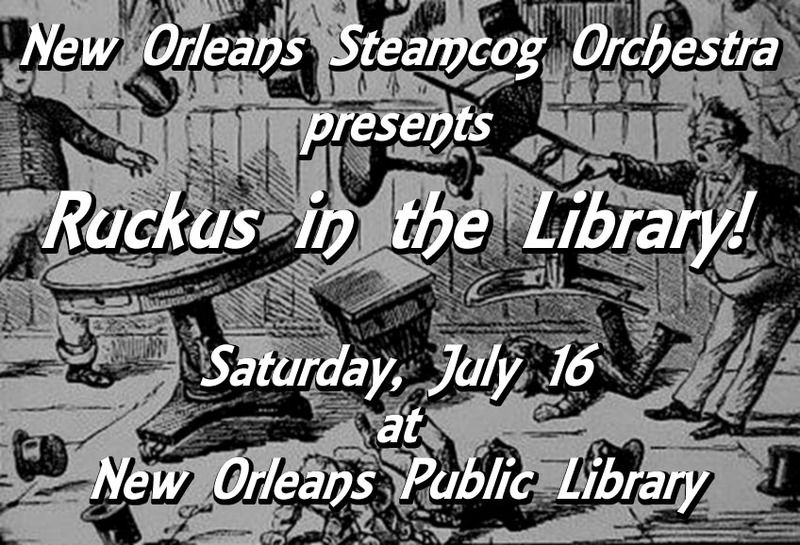 Very pleasant afternoon capping off the library's 2nd annual 'Geek Fest' convention. 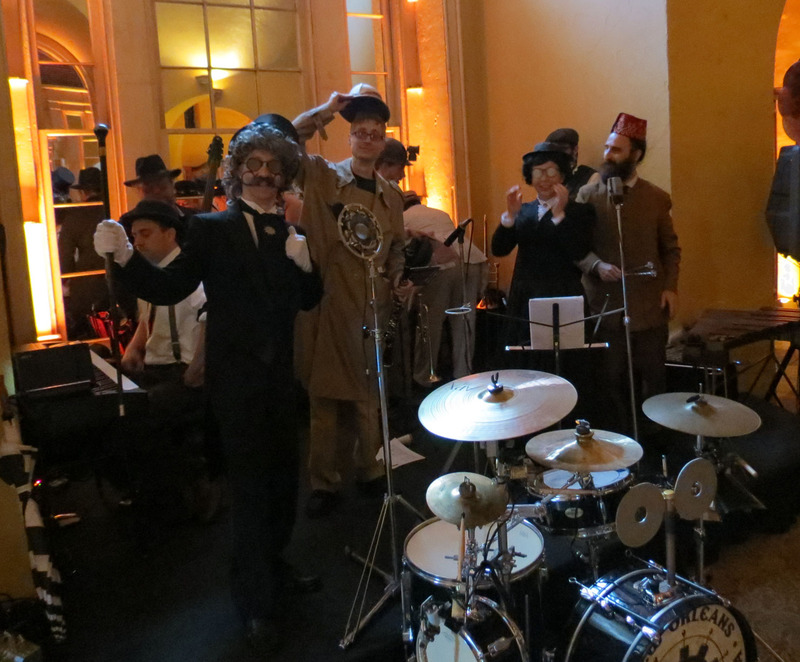 Professor Pinkerton donated a one million dollar bill to the library for the occasion! 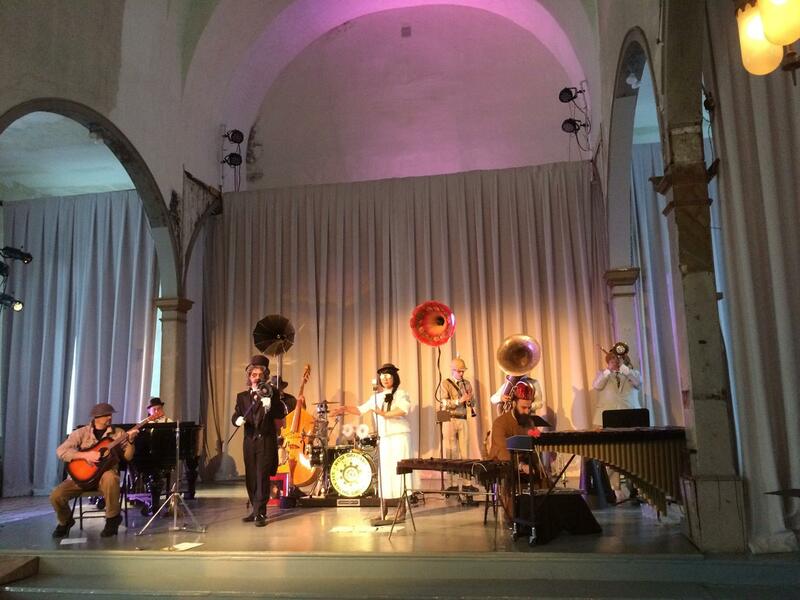 Lovely night in the echoey but beautiful old church building that is now the Marigny Opera House - ending in an attack by Milo T. Pinkerton III, who attempted to deport Prof. Pinkerton and Formelda to the paleozoic era! 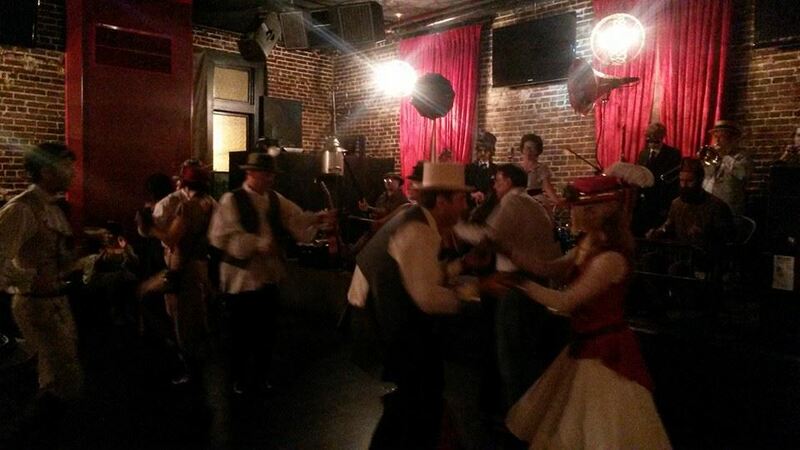 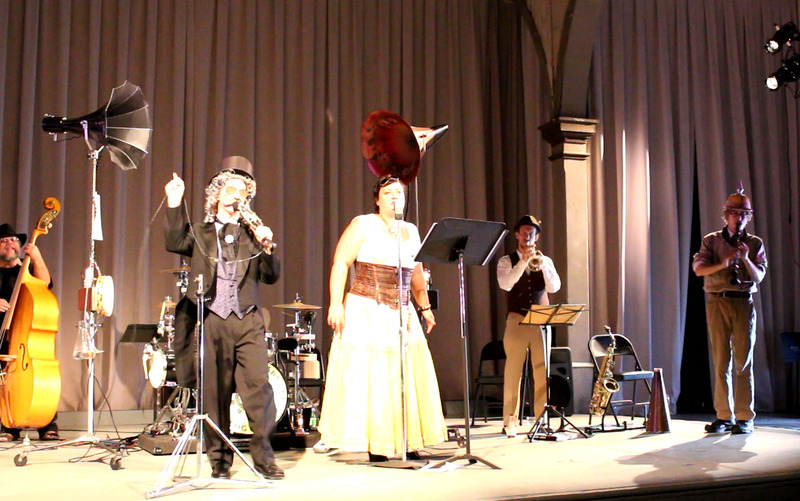 This outing at Banks St. saw a really enthusiastic audience with lots of steampunk dance enthusiasts! 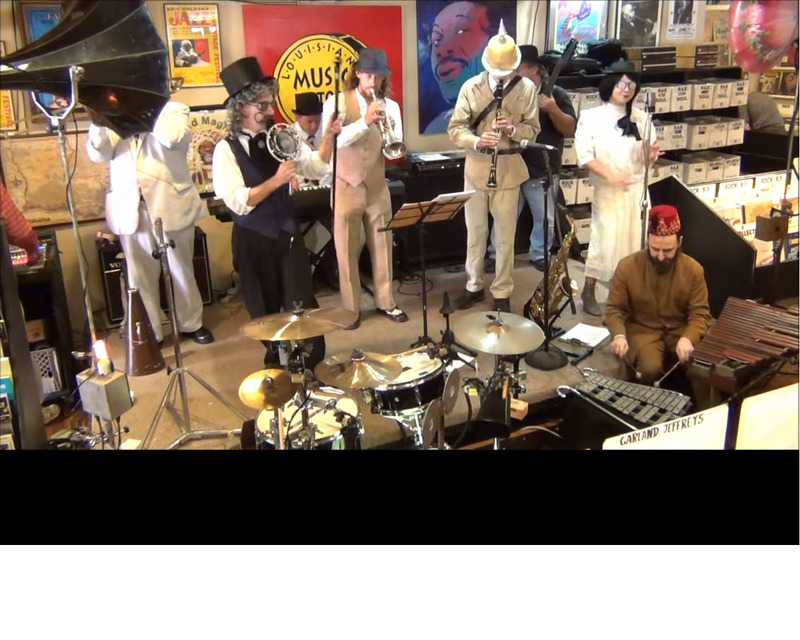 Fun afternoon set at our favorite record store. 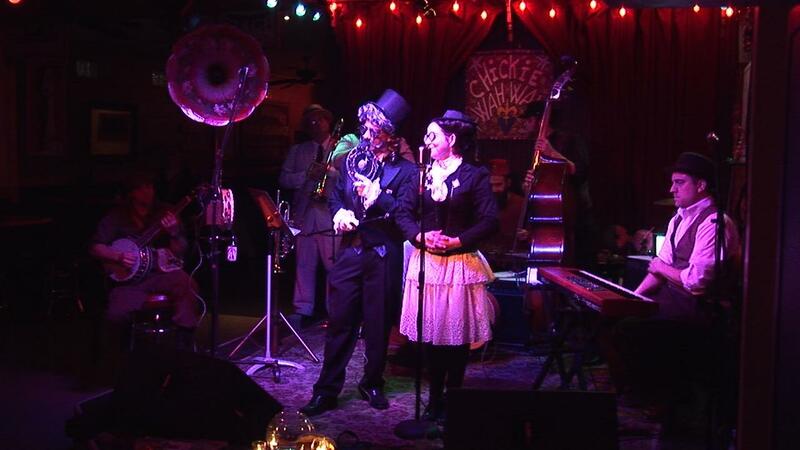 Wonderful audience for our first show of the year, at the den of the Mystic Krewe of the Silver Ball! 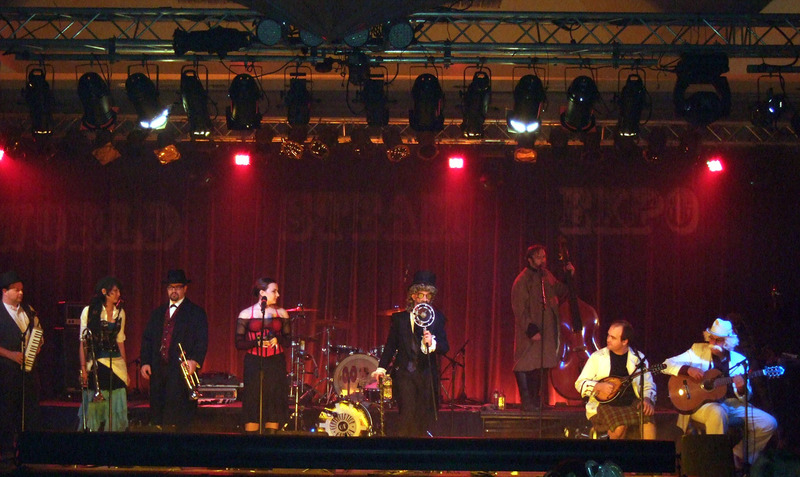 A modestly attended but very well performed debut concert for Steamcog's new album 'Victory Through Steam', graced by a wonderful airship cake by Rebecca Smith. 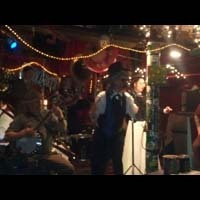 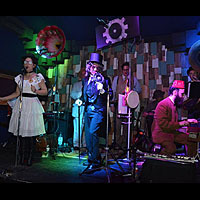 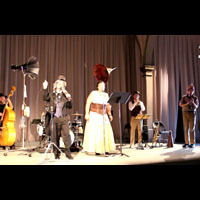 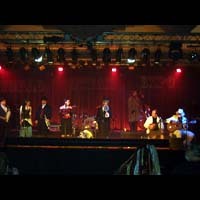 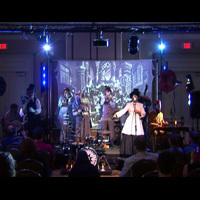 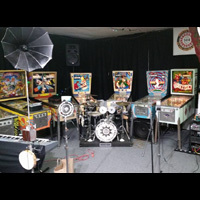 The Steamcog Orchestra took their show to a new level with deluxe staging and synched films for a good deal of this well received set. 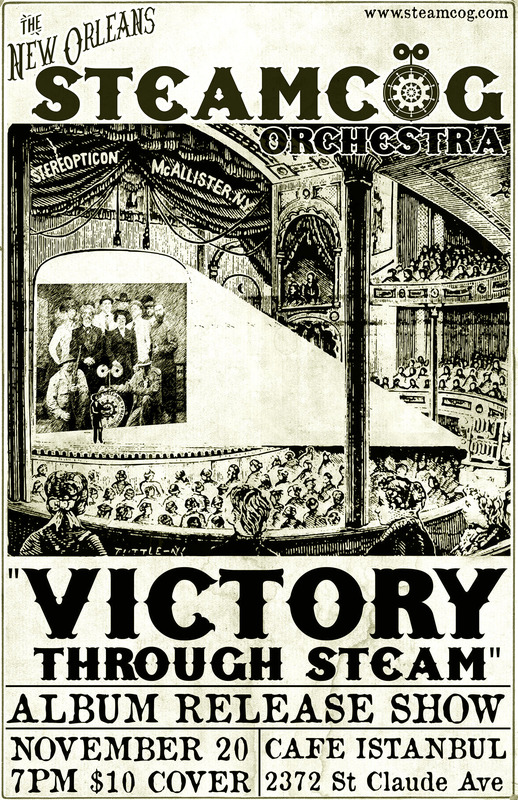 This evening also saw the early debut of their new album 'Victory Through Steam'. 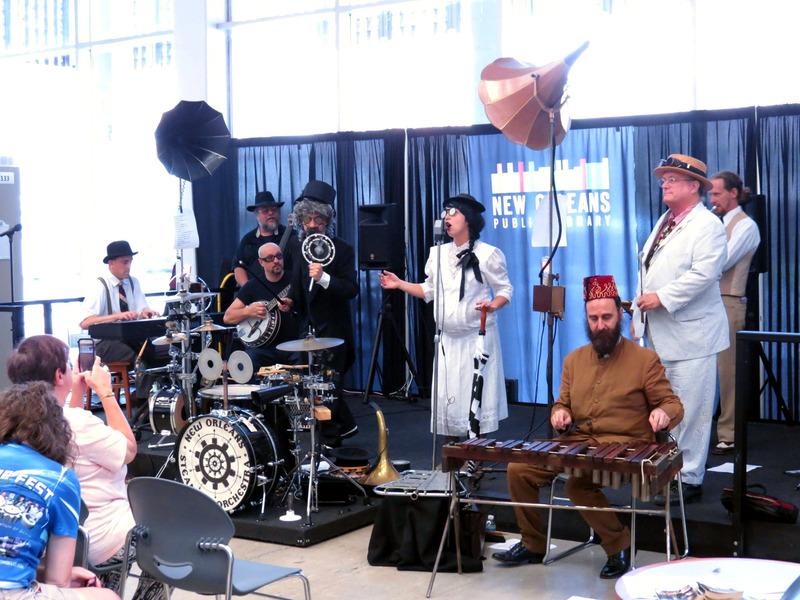 A private party for Hosts New Orleans began as a steampunk street parade and ended up at the pretigious Latrobe's building - historic New Orleans architecture with some very interesting acoustics! 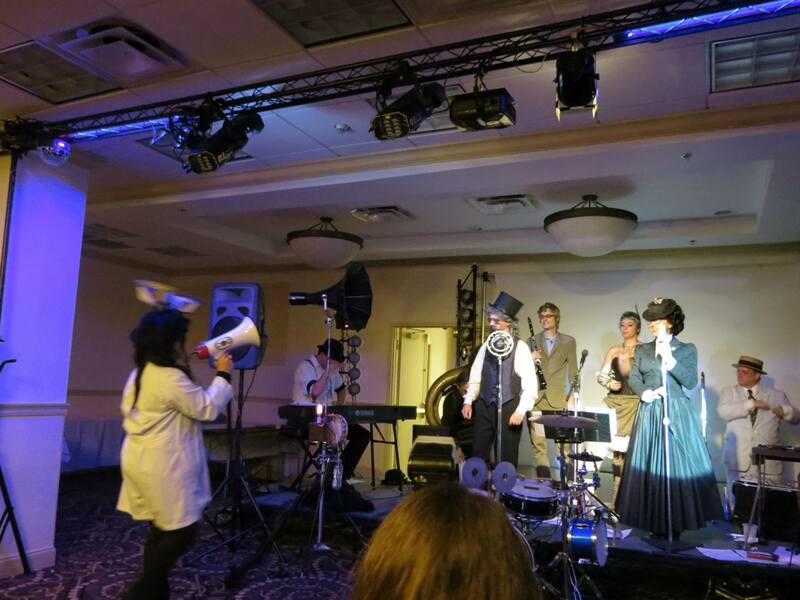 Our first night at the wonderful Buffas was an unpredictable evening, with the unexpected absence of Formelda and noise ordinances to contend with. 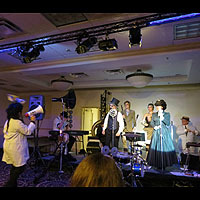 Nevertheless, a very fun evening in front of a very boisterous crowd! 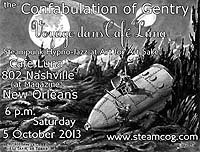 In the end, it was brought to a close by Cogsworthy running out of steam. 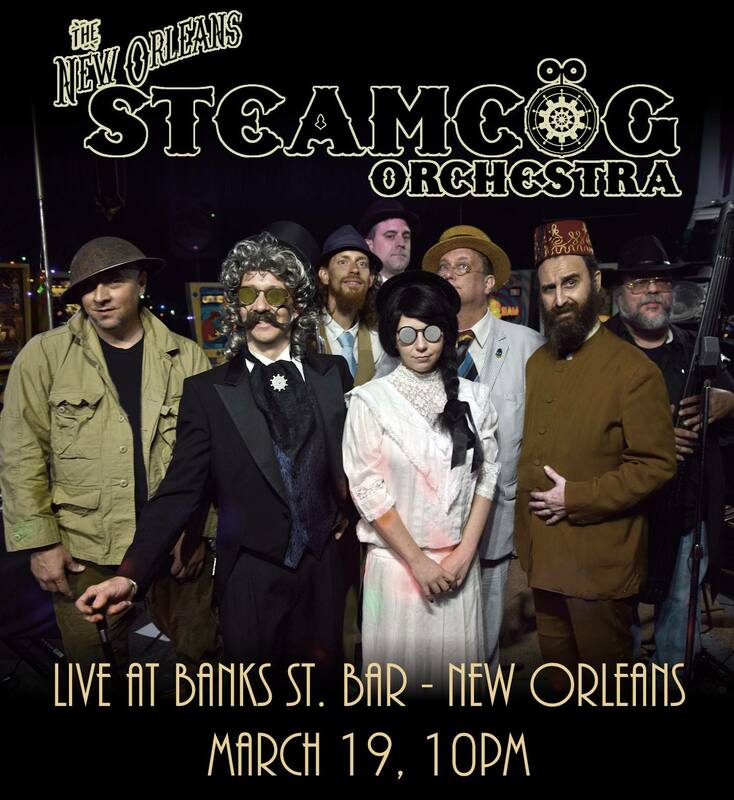 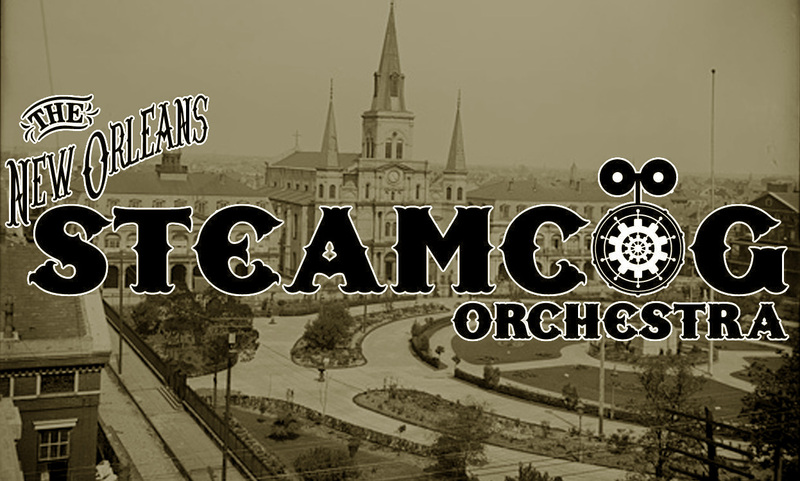 A wonderful recital by the New Orleans Steamcog Orchestra, marred only by the unexpected onslaught of a Stormtrooper during the performance of the Star Wars 'Cantina' tune! 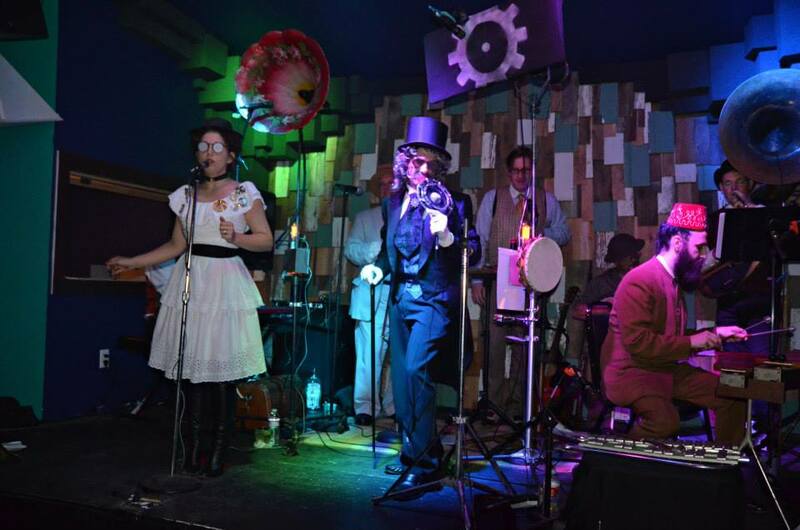 Our live debut under the new band name, with new embellishments on the drum kit and instrumentation, and a tight and energetic performance that was well received by all. 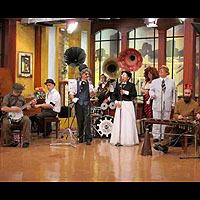 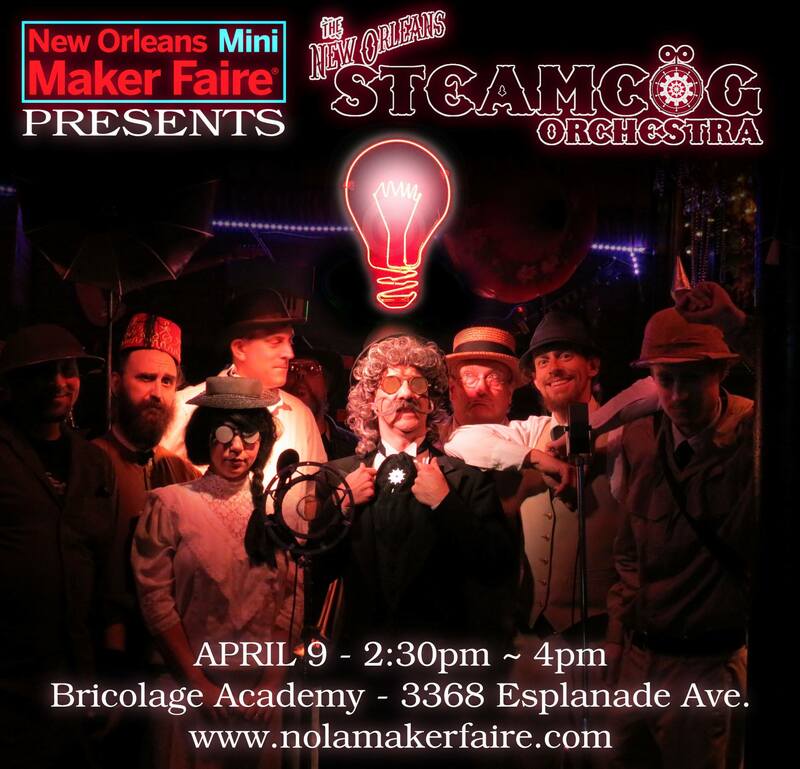 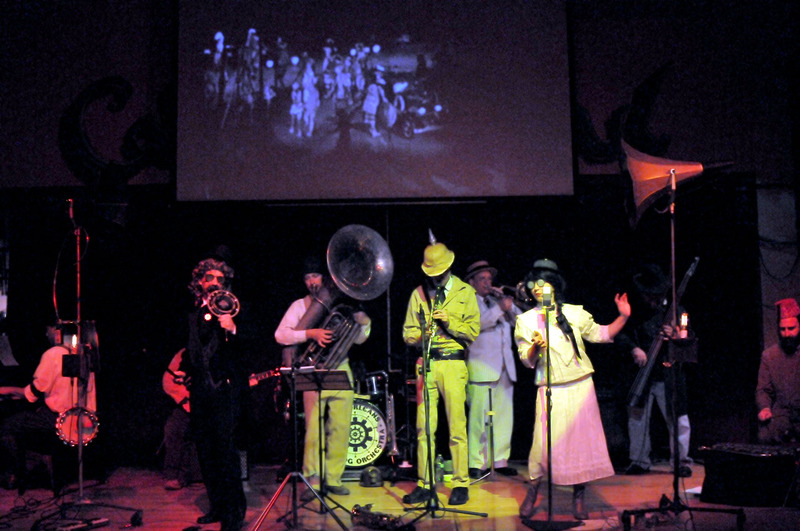 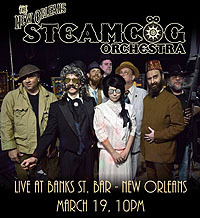 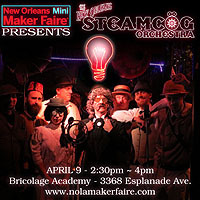 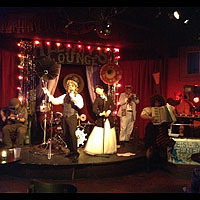 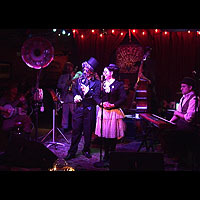 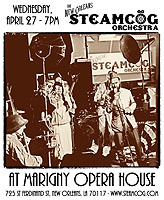 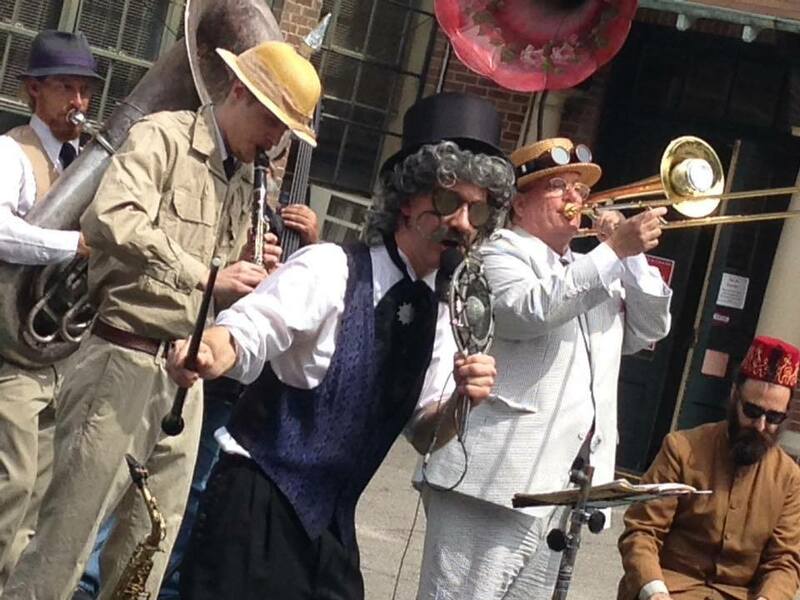 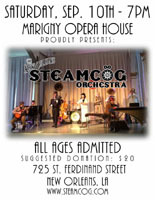 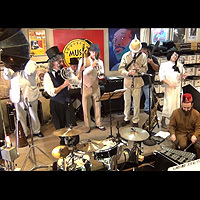 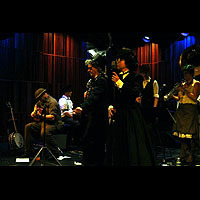 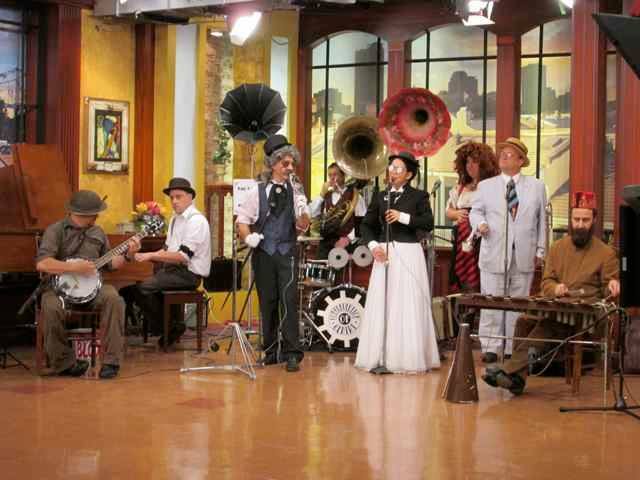 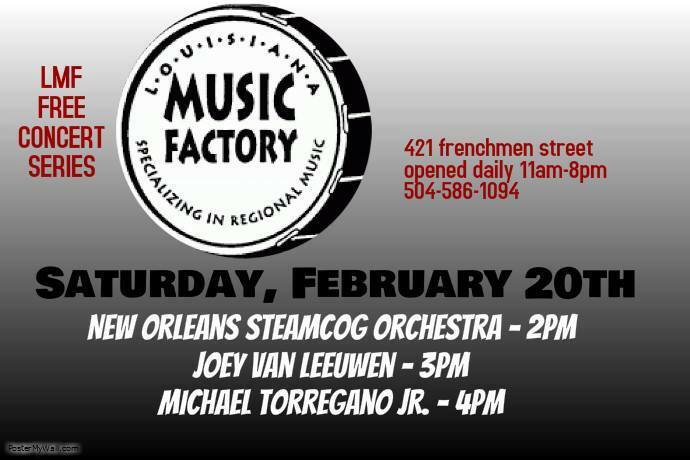 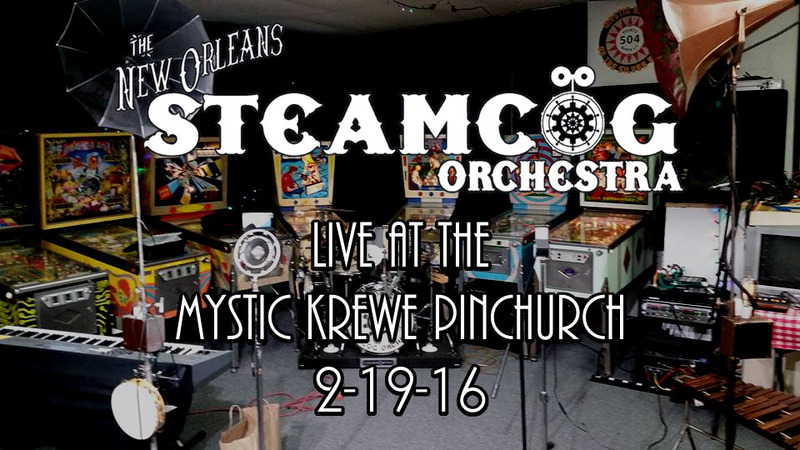 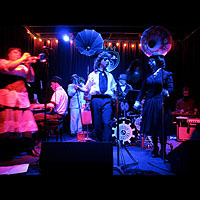 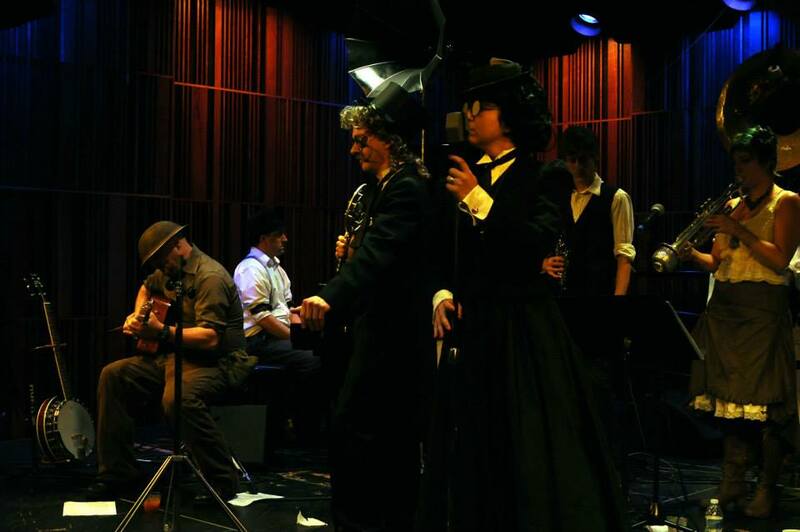 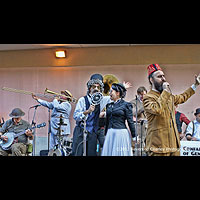 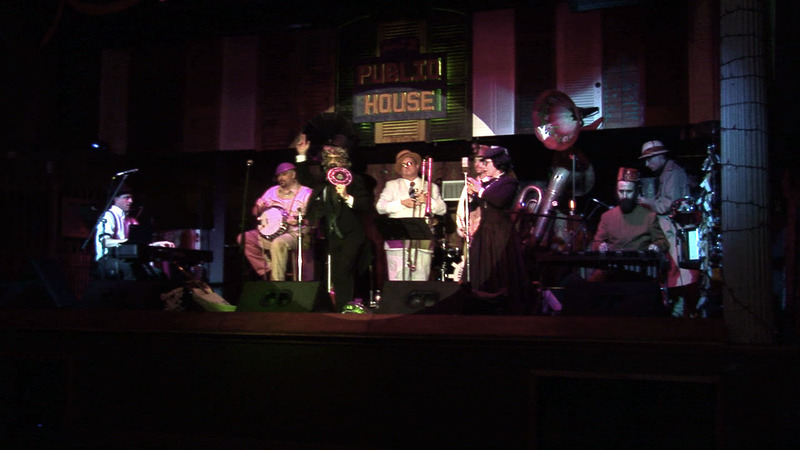 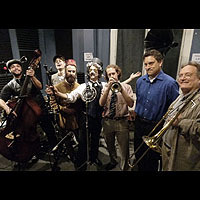 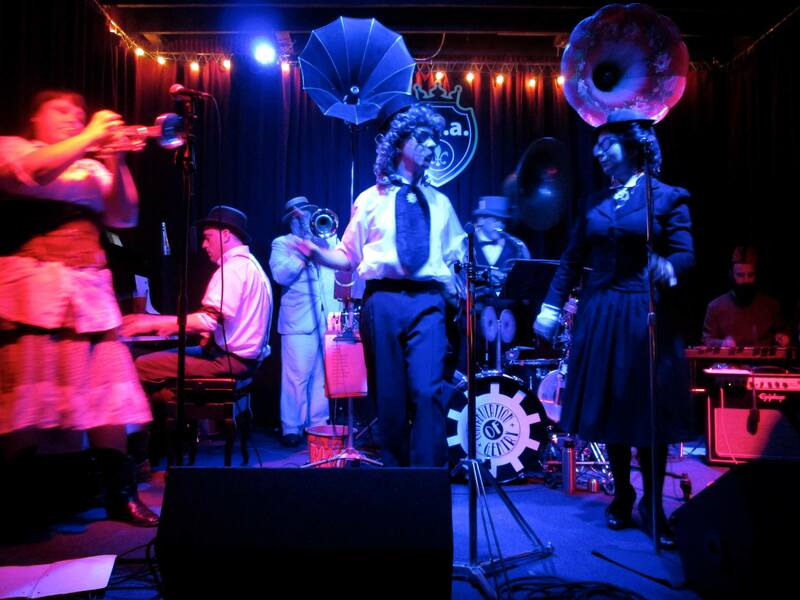 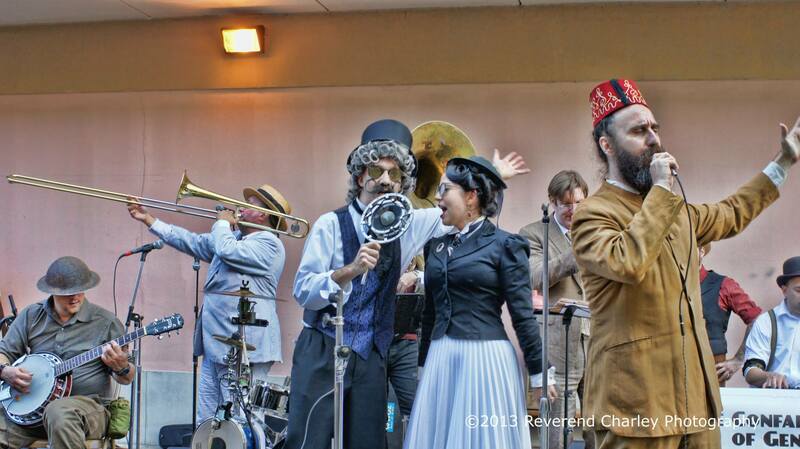 The New Orleans Steamcog Orchestra makes its television debut, charming the hosts of the WWL morning show! 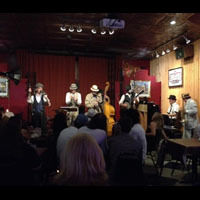 A fun, laid-back night at the newly refurbished Banks St. Bar, and a good time catching up with old friends and new fans! 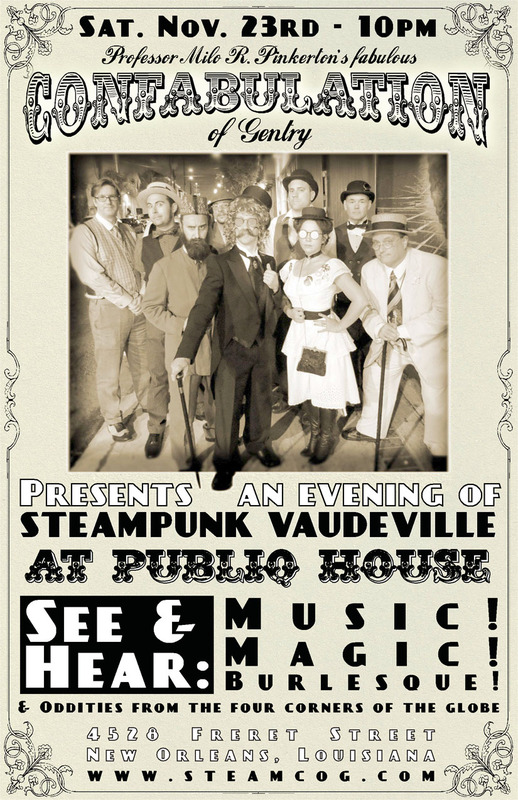 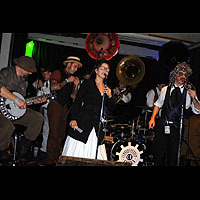 A chance to open for touring steampunk band 'Frenchy & the Punk' resulted in a good excuse to rally the newly reformed Confabulation to stage-readiness, and boy was it a good move... fantastic tight show, appreciated by a small but enthusiastic crowd. 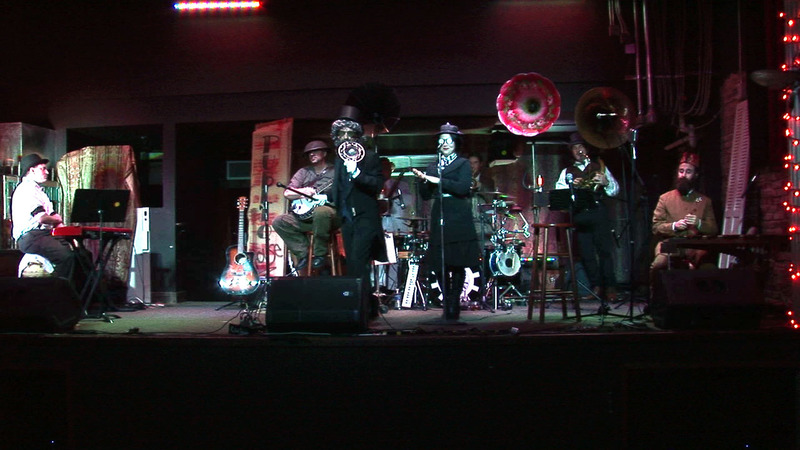 Debut night for new bass player Labonzo Dogmann and trumpet player Patrick O'Doyle. 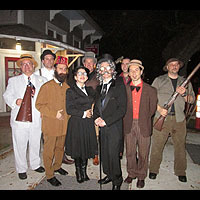 This chaotic show was interrupted at the end by Dr. Milo T. Pinkerton III, once again gunning for his grandfather! 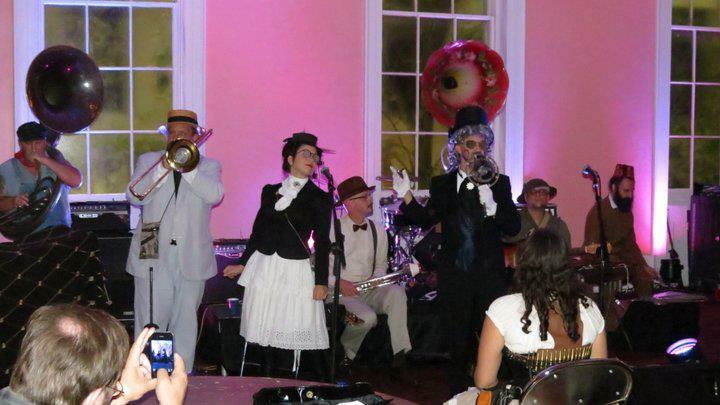 A great gig at a distinguished venue, this occasion had us united with the grandfather of steampunk, Jules Verne, with some reat silent films by Georges Melies playing while we performed. 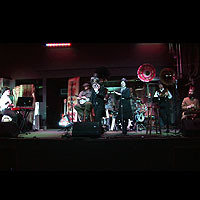 First show with Jeanavieve on trumpet. 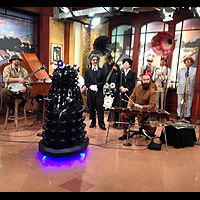 Fantastic fun with our friends in Lafayette, as we debut our new clarinet player Percy, a new song, and our new EP, 'Tales from the Airship'! 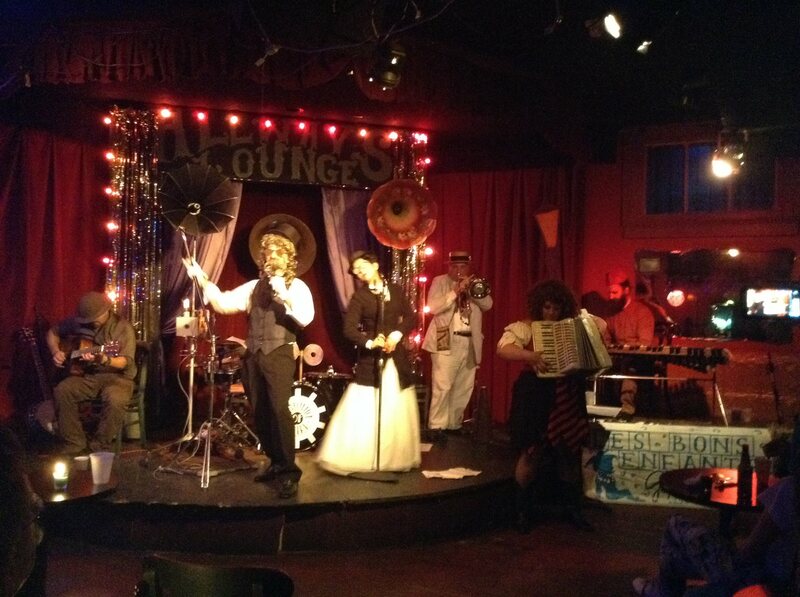 A fun and sweet-sounding night at Banks St., featuring the debut of our new trumpet player Dante. 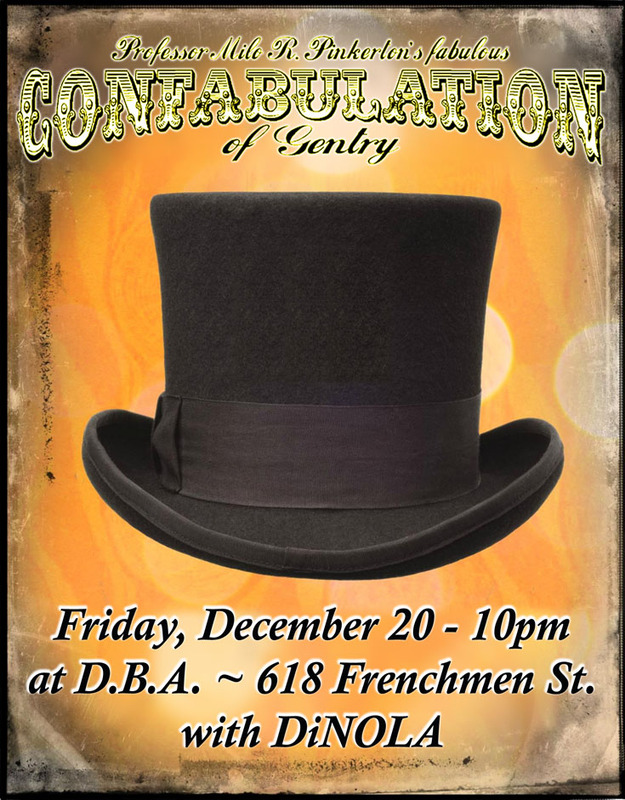 Surprisingly great night at d.b.a. 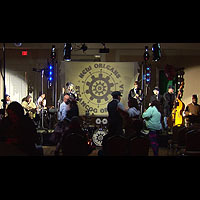 - great sound and crowd made this opening spot well worthwhile. 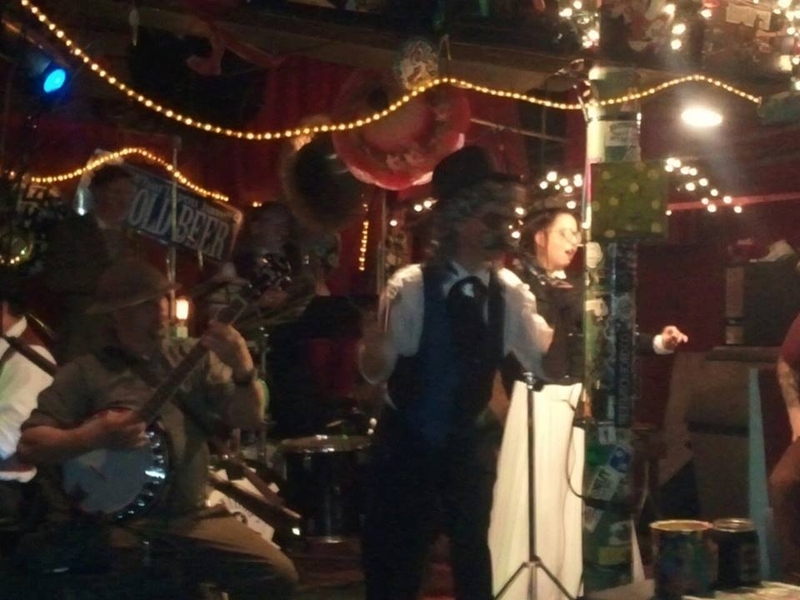 The Confabulation of Gentry's first attempt at a full scale Vaudeville show went quite well, considering the short notice with which it was assembled! 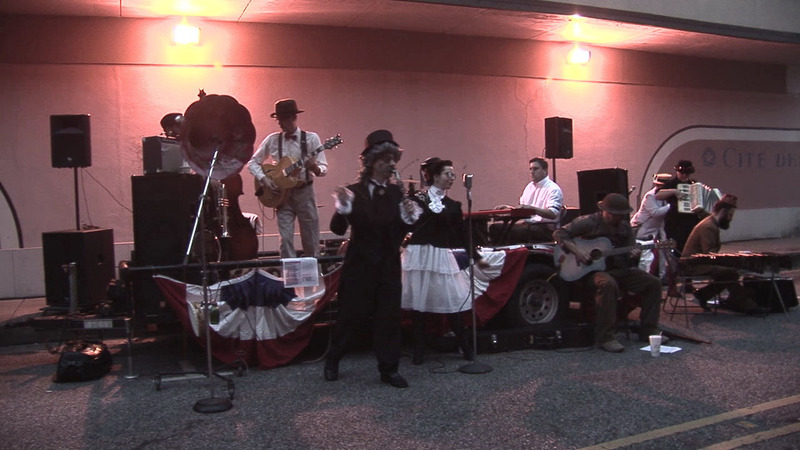 Dante and Karl were last minute additions to the act but performed spectacularly, to a very appreciative crowd. 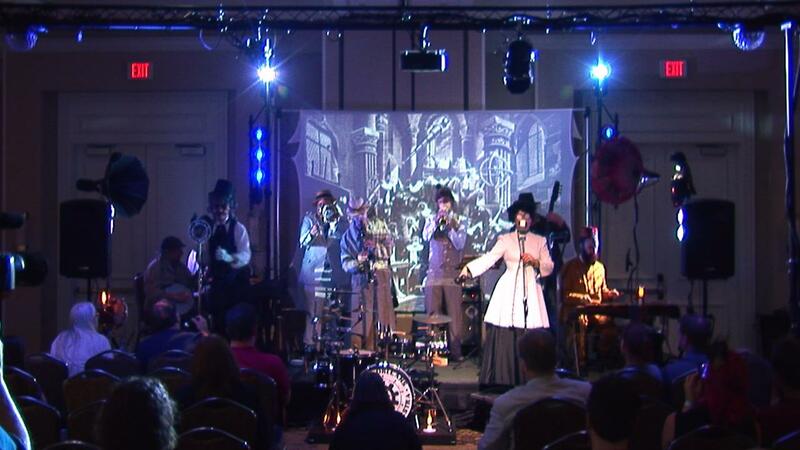 Performing at the second Lafayette Steampunk Festival, the Confabulation electrified the considerably larger crowd and made many new friends! 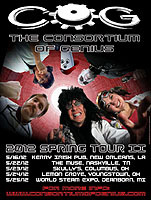 The League of G.E.A.R.S. 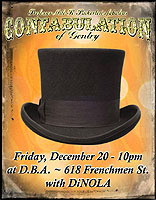 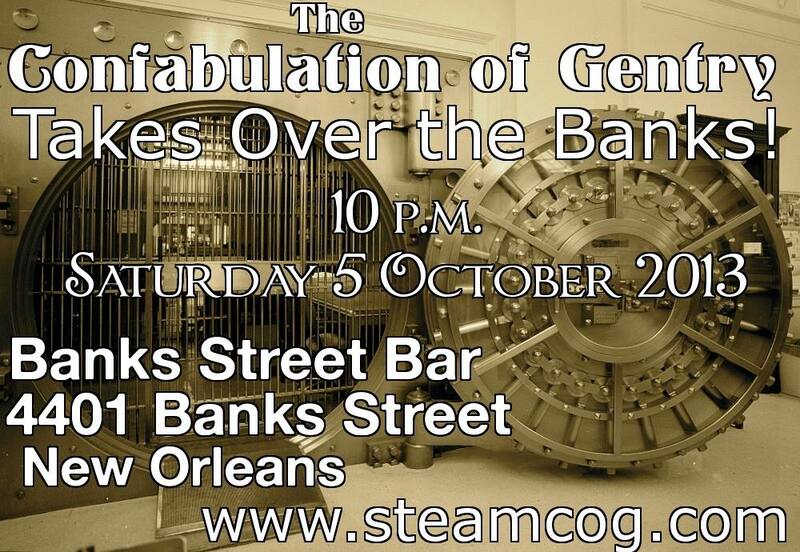 contribute a memorable cameo, trying to apprehend Prof. Pinkerton once again, as The Confabulation of Gentry makes its television appearance on the Halloween edition of The 504! 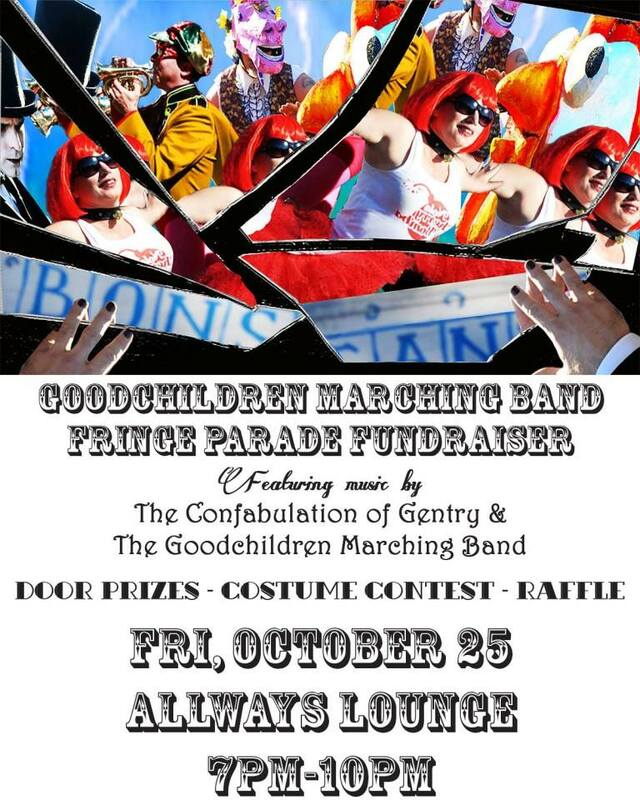 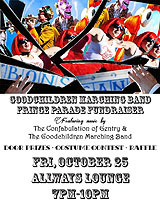 Performing a benefit for the Goodchildren Social Aid & Pleasure Club (containing several past and present members of the Confabulation! 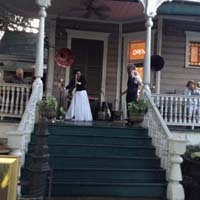 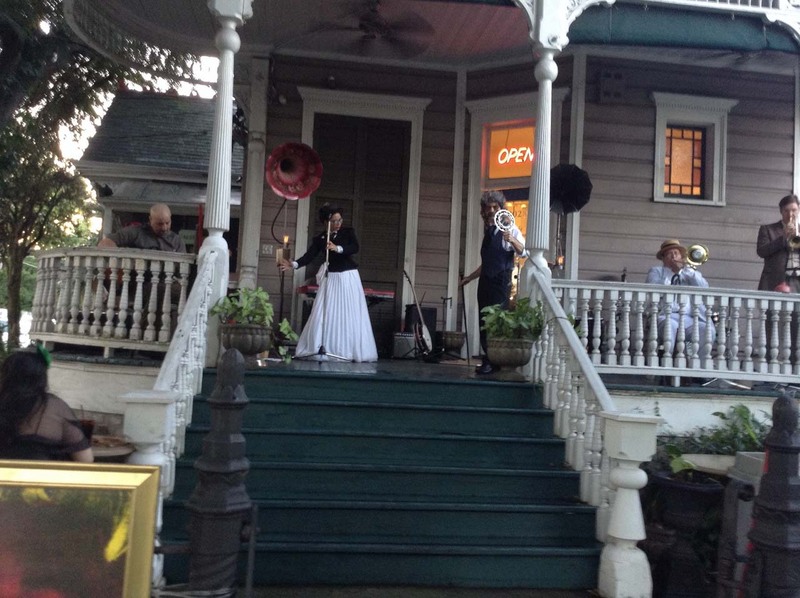 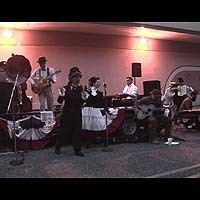 ), we had a fine time performing on St. Claude Ave. 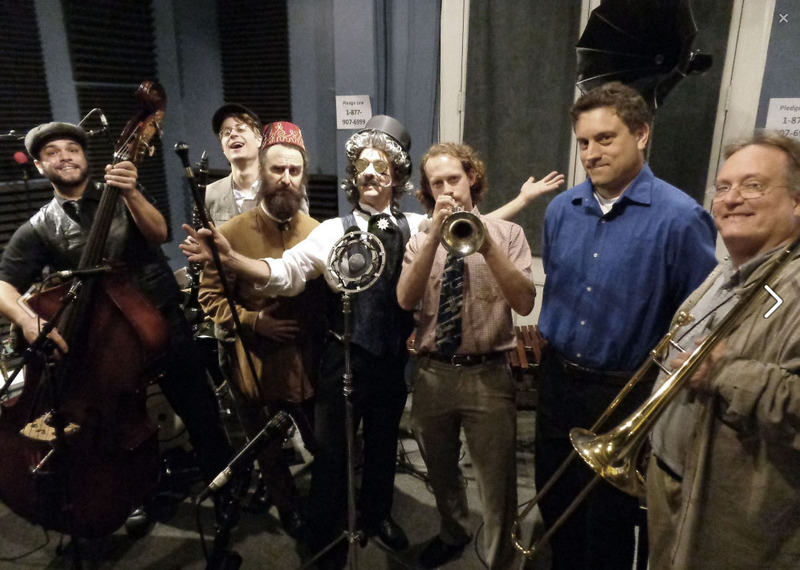 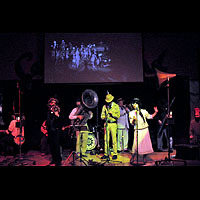 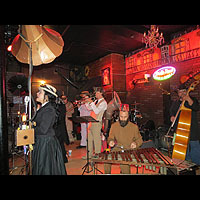 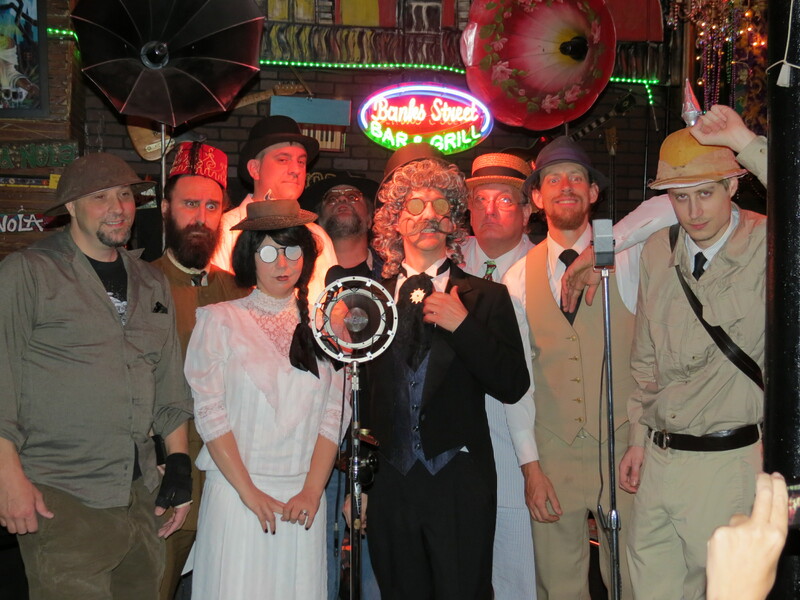 The LACK of a hurricane proved to be no impediment to a great hypno-jazz hurricane party by Prof. Pinkerton and his valiant crew, debuting their new 'Airships' song and a couple great old classics. 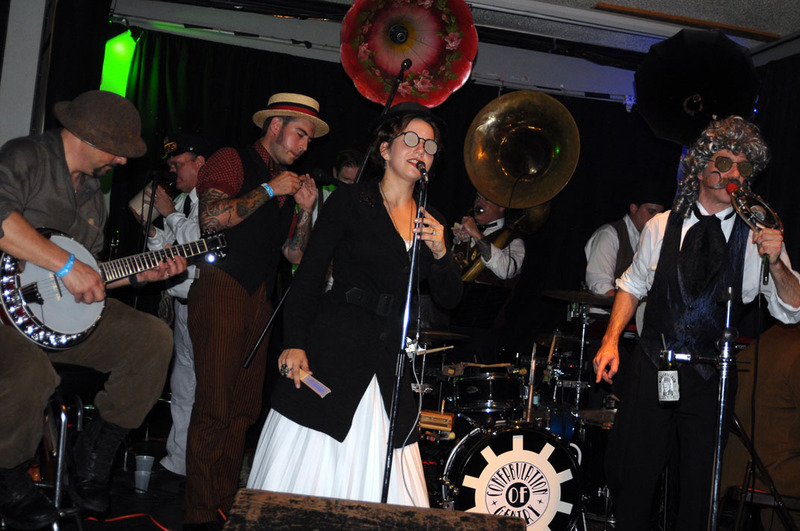 The LACK of a hurricane proved to be no impediment to a great hypno-jazz hurricane party by Prof. Pinkerton and his valient crew, debuting their new 'Airships' song and a couple great old classics. 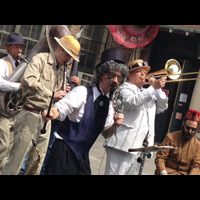 A 'jazz funeral' and 'seance' proved to be merely an ornate attempt by Prof. Pinkerton to defraud his way into Dr. Milo Pinkerton's inheritance... until the unexpected surprise appearance of the Anti-Pinkerton! 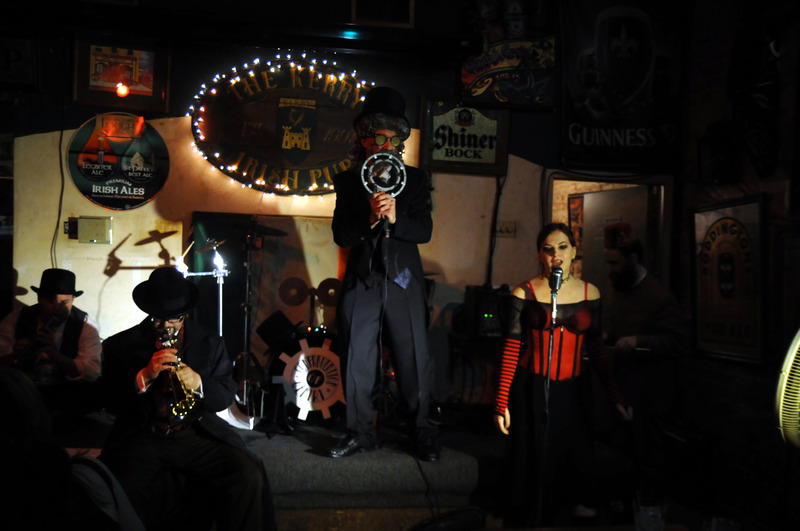 Despite our drummer getting a hot foot, this proved to be quite the night for our new lineup, including a wonderfully freakish performance between sets by our new saw player! 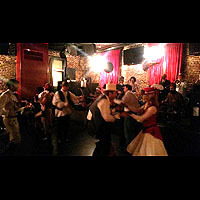 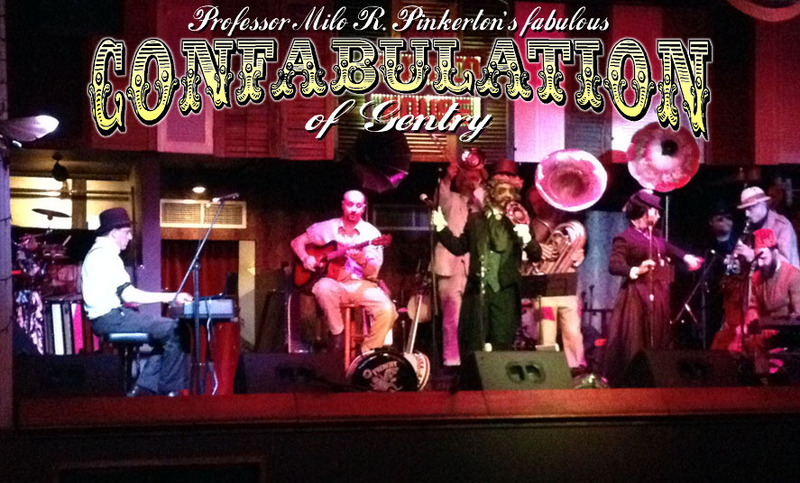 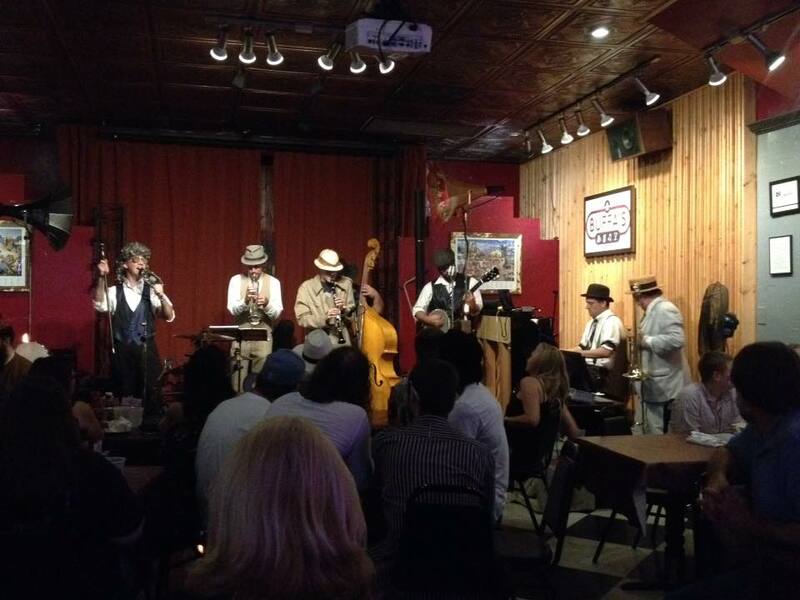 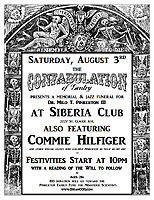 Joining Beth Patterson for her CD release, the Confabulation of Gentry wowed the crowd at Chickie Wah Wah until Dr. Milo T. Pinkerton reappeared, intent on bringing the festivities to a violent end! 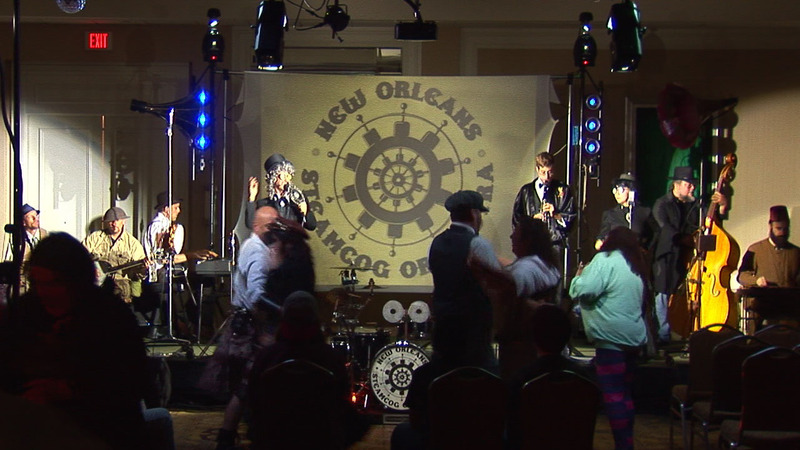 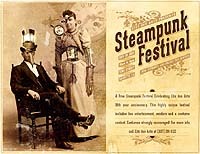 Very little resistance to a full hypno-takeover of the inaugural Lafayette Steampunk Festival (abetted, no doubt, by Prof. Pinkerton's smooth crowd bribery) the Confabulation furthered their influence and entertained the entire Lafayette Steampunk community. 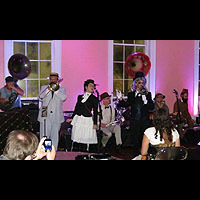 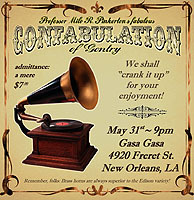 Capturing the ballroom at Gallier Hall, the Confabulation of Gentry nevertheless failed to prevent Dr. Pinkerton from attempting to stop their performance after the debut of their new song '28 Skidoo'. 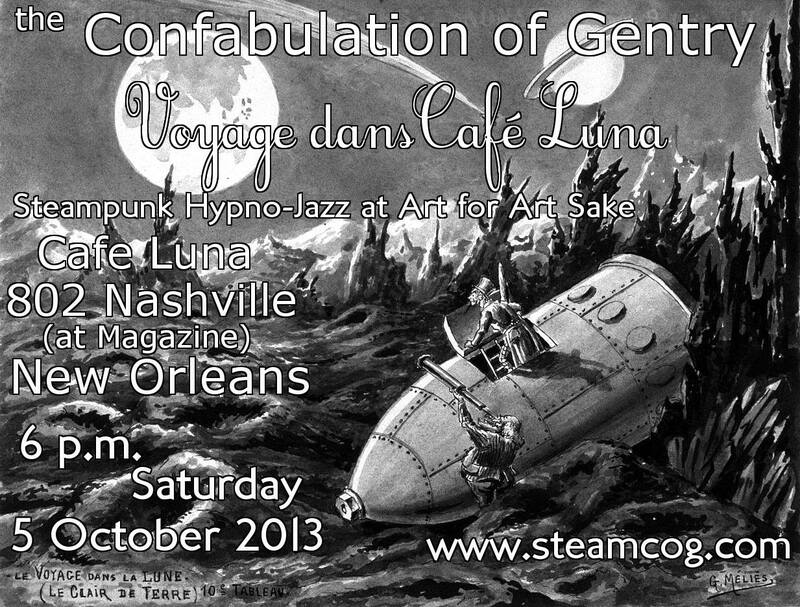 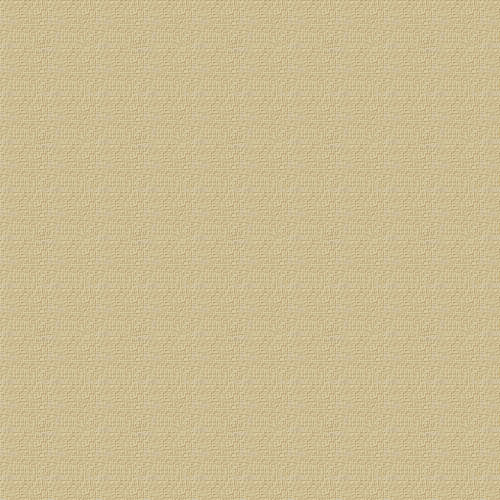 In the end, though, the Confabulation of Gentry emerged victorious! 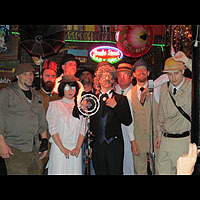 Circus of Nightmares / Taco Supremo / Top Hat / The Angel of Death / Bucket of Blood / Everyone Dies (But Me) / Zombie Apocalypse BBQ / March of the Skaletons / Reach Out and Touch the Hand / Doctor Who cha cha / Placebo! 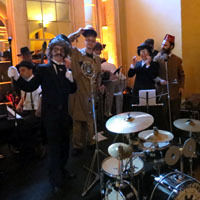 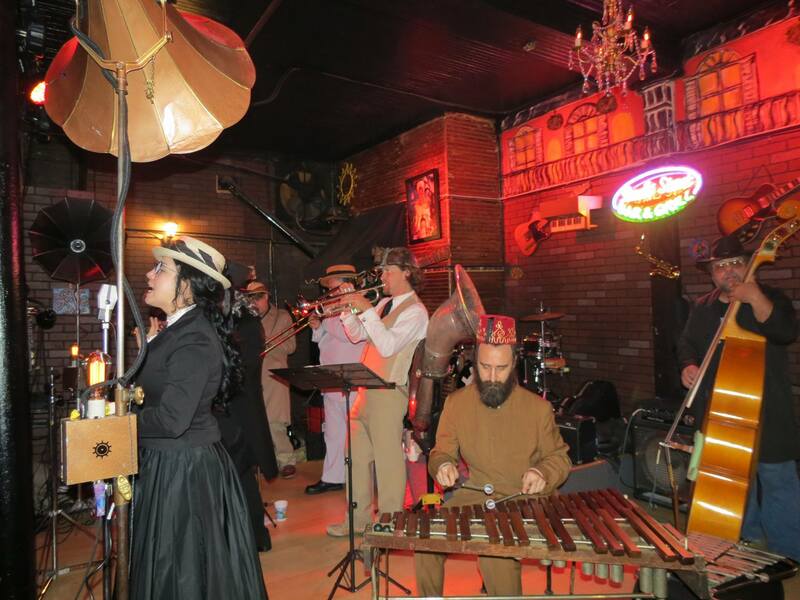 The premature breakdown of our Clockwork Percussionator didn't stop our Steampunk ancestors from continuing to swing, even to the point of hypnotizing one of the staff to play the drums for a couple tunes! 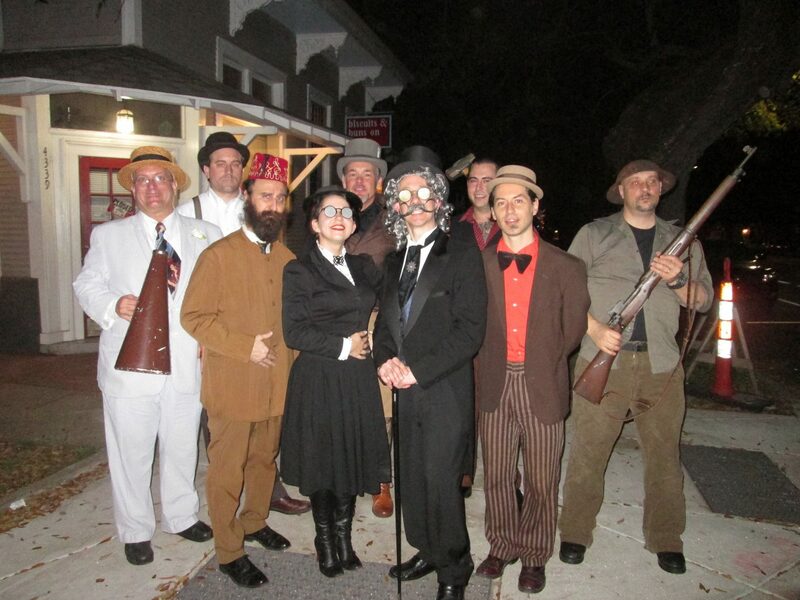 A sterling success, despite Prof. Pinkerton's premature arrest by the Temporal Police. 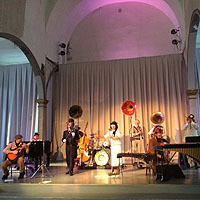 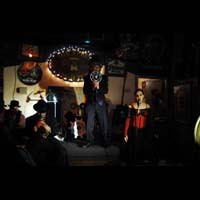 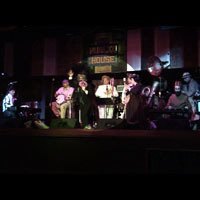 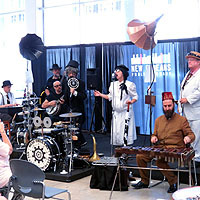 A discreet 'exhibition' show to try out the jazz version of the band onstage was met with much applause from the Steampunk community of New Orleans. 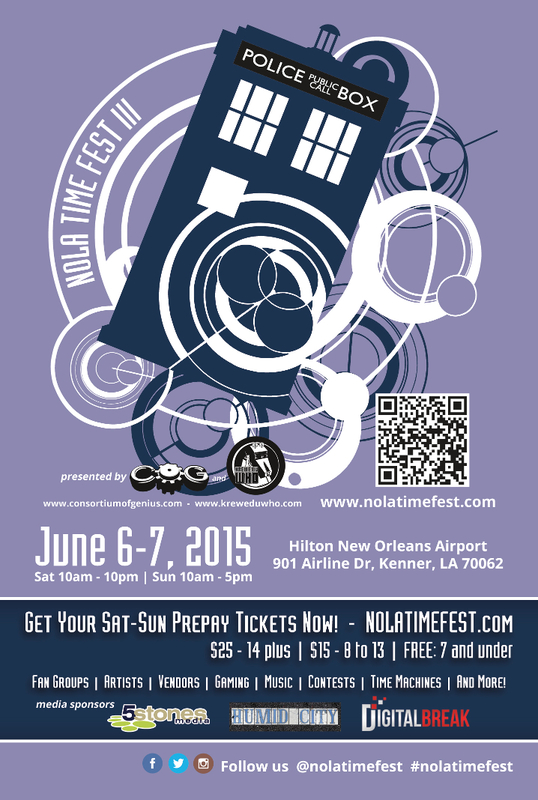 In the end, Prof Pinkerton was dragged away by Inspector O'Reilly of the Temporal Police!